In the new SuperKEKB accelerator in Japan the first collisions of matter and anti-matter particles have been detected. Scientists from LMU and the Universe Cluster are involved in the experiments. SuperKEKB accelerates electrons and positrons circulating in opposite directions before they are brought into collision in the Belle II detector. Belle II records and analyzes the consequences of these collision events. “The particle tracks must be measured very precisely if we are to detect decays that deviate from the norm,” explains Dr. Hans-Günther Moser from the Max Planck Institute for Physics (MPP). “This task falls to a high-sensitivity pixel detector, which is sited directly at the collision point in the center of Belle II.” Prof. Dr. Thomas Kuhr from the LMU adds: "In addition to improved detectors, sophisticated algorithms are also required in order to find the smallest deviations when analyzing the large amounts of data recorded." A few weeks ago, one electron and one positron beam were fed in. 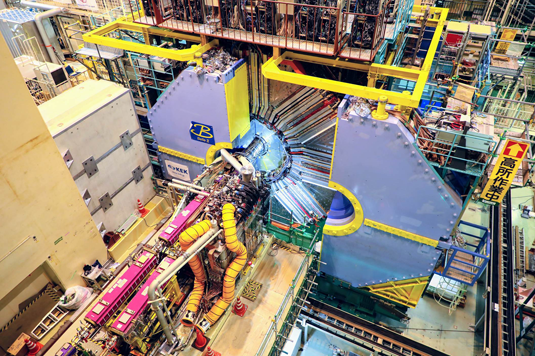 Since then, scientists and technical staff have been working to align the particle beams to the collision point inside the Belle II detector. Additionally, instruments built at the MPP are currently being used to measure background signals that would interfere with future analyses. After this test phase, the final components, including the pixel detector in whose development the MPP has played a crucial role, will be installed and calibrated. The current plan is for the scientific program to get underway early next year.